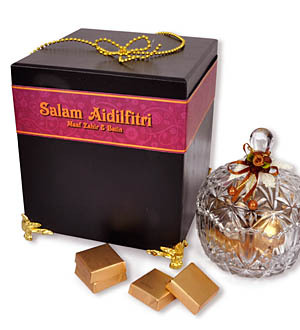 Assorted Patchi Chocolates 160g in Meribah Baroque Glass presented in Handmade Bethel Wooden Box. Message at the outer box will be personalized for the gift. Message such as "Happy Anniversary", "Thank You", "Congratulations", "Happy Birthday", "Salam Aidilfitri" etc are examples of message that we will customize accordingly when you place your order.